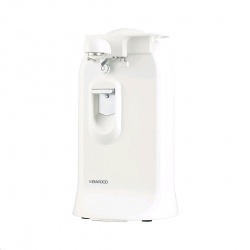 Enjoy the pleasure of having a nifty little device take care of the hard work with the HM220 Hand Mixer from Kenwood. Designed to be easy to use and practical, the HM-220 Hand Mixer has a comfort moulded handle and simple thumb operated speed controls. 3 dedicated speeds allow you to fold, mix and whisk up delicious foods in minutes, and an advanced cooling system gives you a more energy efficient motor. Non-degradable stainless steel beaters on the HM220 Hand Mixer let you know that you've got a quality product which will go the distance, and the sculpted shape of the HM220 Hand Mixer is super easy to clean, allowing you to spend more time eating than washing up. 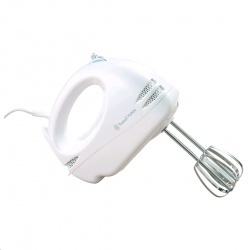 In cool white and compact enough to be stored with ease, the HM220 Hand Mixer is a great product for any level of chef. 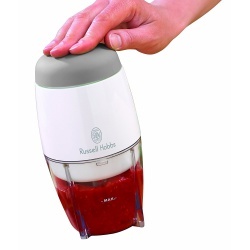 At the heart of your home, the Russell Hobbs Hand Blender will help you create more delicious moments than ever before. Simple, yet effective, the powerful 200W blender offers a choice of two different speeds, giving you total control over the consistency of food. The stainless steel blades are designed to keep it simple by providing maximum durability & performance, in every use. The blender also incorporates a detachable leg feature that ensures cleaning your device after use is super easy & a complete breeze. Designed for those who like life to be uncomplicated, this is the perfect device for you. 2 speed settings and pulse function. 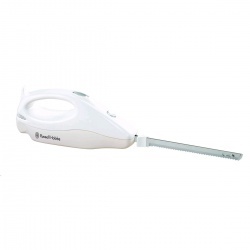 The Morphy Richards 150W Carving Knife features a serrated blade to help you get through those tough joints of meat. 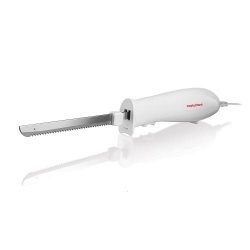 With a comfort grip handle, a convenient thumb tip control button and power and blade release buttons this carving knife is sure to be hassle free and safe to use. Its easy wrap cord storage will also help to keep your kitchen cupboards tidy. The 5-speed hand mixer in a white finish will grace any kitchen. 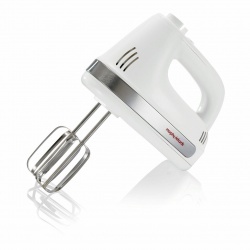 It has 5 dedicated speeds - for folding, mixing and whisking. Includes 2 x 0.5L spill proof travel goblets with lids. 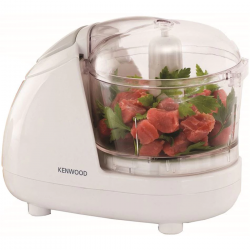 The CH180 Mini Chopper from Kenwood is an affordable product that any chef or cooking enthusiast will love! This attractive product is a brilliant addition to any busy kitchen and comes recommended by Delia Smith, in Delia's 'How to Cheat at Cooking'. 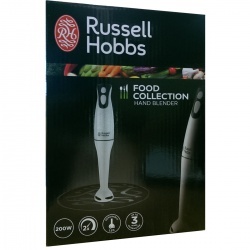 Compact and attractive, the CH180 Mini Chopper has a 350 ml capacity, great for chopping herbs and spices for sauces! 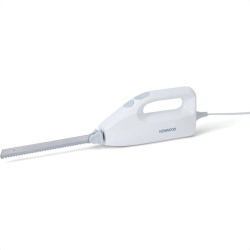 Weighing only 950g, this lightweight gadget quickly dismantles for easy cleaning and has a cord grip to allow for tidy storage. For peace of mind, an in-built safety system prevents access to the blades while the machine is in operation, and the tough rubber feet grip tightly onto surfaces to prevent accidental slippage! A simple 2 speed control makes the CH180 Mini Chopper simple to use, and with stainless steel blades you will be sure to achieve consistent success with this practical and multi-functional chopper! From carving a Sunday roast to slicing bread, you can accurately and easily cut as thin or as thick as you want – it even comes with additional freezer blades for tougher cutting tasks. The dishwasher-safe blades come with a quick release feature, so cleaning is always fast and easy. This great value addition to your kitchen accessories is sure to save you time and effort. The Kenwood knife has been designed to bring speed, safety and comfort to everyday use – taking the effort out of slicing meats and bread. The KN650 features a removable blade system and even comes with an additional set of blades for slicing frozen food. The sharp, stainless steel blades are easily removed and completely dishwasher safe for cleaning convenience. Compact and safe, the Kenwood KN650 Electric Knife makes a great addition to the kitchen drawer. Simply choose how pulpy you want your juice – easily adjust the amount of fruit pulp by turning the jug within the pulp scale. No additional buttons – easy handling by simply pressing down the fruit to start and lifting it off to stop. Easy &amp; time-saving – can be disassembled in a few quick steps before putting the removable parts into the dishwasher. Alternating rotation of the juicer cone decreases the strain of squeezing and increases the amount of juice extracted. Very handy for precise dosage for any recipe – like fruit cocktails etc. The Tefal HB1011A4 Hand Blender makes your prep chores easy and stress free. It features a comfy-grip handle that is designed to offer an ergonomic hold. Its high resistance metal wand and stainless steel blades cut thought all types of ingredients, from soft to hard. 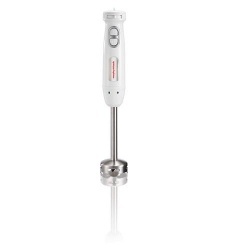 Powered by a 350W motor, this hand blender offers superior performance. Easily operate the blender using the pressurized speed button. This kitchen blender comes with an 800ml graduated goblet.